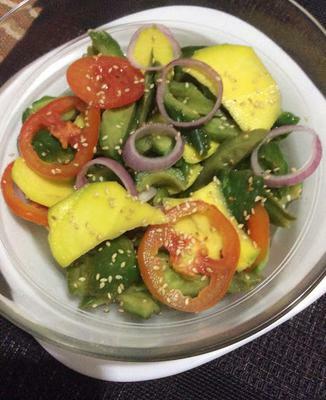 Ampalaya and Mango Salad is a perfect side dish especially to any fried food. Cuts through the greasy aftertaste with its several taste elements : bitter, sour or tart, sweet -- and you could add spicy hot, if you wish. The ampalaya here is uncooked, just briefly set in boiling water to soften a bit, then left to marinate in a pickling solution of vinegar with salt, pepper and sugar. Added to the salad is a sweet and tart, cut-up, half-ripened apple mango (or Indian mango), and some red onion and tomatoes. To take it up a notch, so to speak -- add some crushed chili peppers on the pickling vinegar when you're boiling it to bring some heat to this explosive salad. 1. in a sauce pan, combine water, vinegar white sugar, crushed chili pepper (optional), and salt and pepper. 2. Boil for a minute and set aside to cool down. 3. 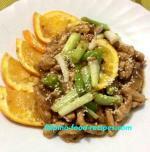 Cut the ampalaya along the length and scoop out the seeds. 4. Slice into desired bite size pieces. 5. Sprinkle and rub with rock salt to sweat out the bitter juice, then pour some boiling water. 6. Rinse in running water and squeeze out extra liquid. 7. Peel the mango and cut it into desired bite size pieces. 8. Slice the tomatoes thinly and chop the onion. 9. Mix everything together and refrigerate. 10. Serve cold sprinkled with toasted sesame seeds(optional).